Freedom of speech on the Internet must be protected. ....someone didn't like what I have to say? It was certainly predictable. 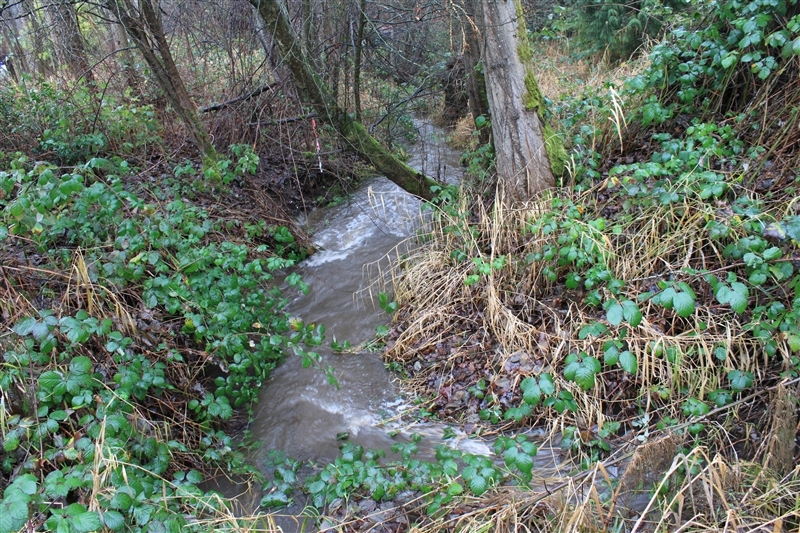 A development project with a stream running through it is cleared of at least a couple acres of trees. That area is essentially left as bare dirt just in time for the rainy season. Think it's going to have a negative impact on the stream? I think at this point that an elementary school student would correctly predict "Yes! ", but how about the adults in charge? The West Creek Village project on the west side of 80th here in Kenmore (Click here to view the West Creek Village plat map) has been in the system for several years. For the last couple of years the property was owned by a bank, until it was sold this summer. We realized something was actually happening with the property only when big equipment suddenly started working there. 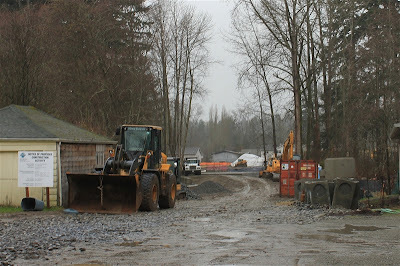 Hundreds of loads of dirt were stockpiled in a HUGE pile on the lot (see my 10/23/2011 post about that here) . We were told that they were stockpiling the dirt to use when work started in the spring. But just in time for the salmon spawning/rainy season, they decided to keep working this fall instead. Hmmmm. Clear. 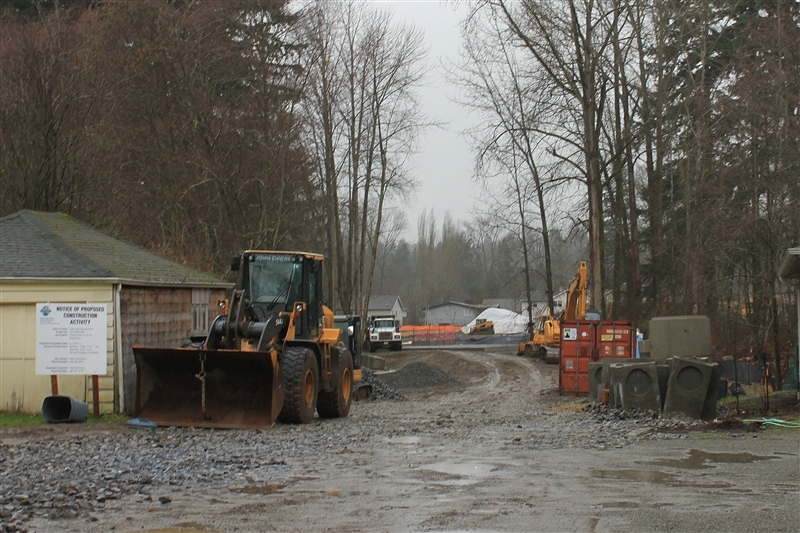 The contact at the city of Kenmore, who for the record is always very polite and helpful, suggested that the turbidity had something to do with the new stormwater retention tank on site and told me that he would talk to them about moving the outflow. Worse. It was rather hard to miss. 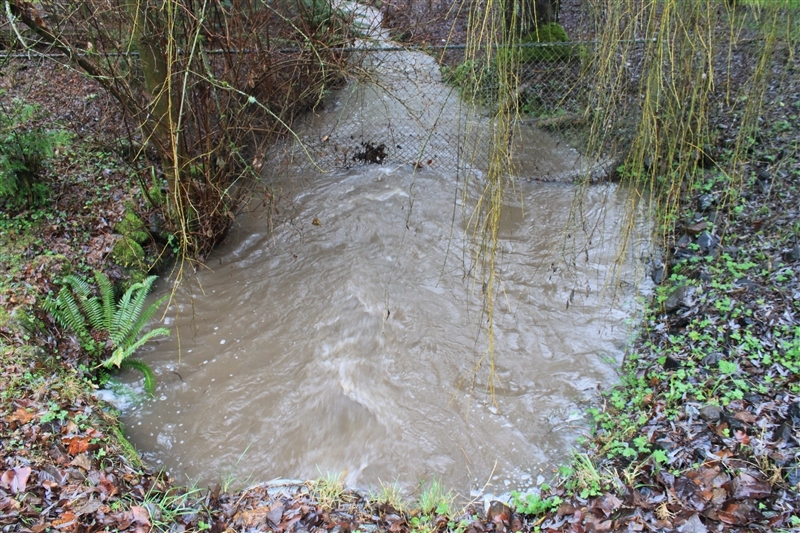 Yes, it had been raining hard today, but as I just mentioned, turbidity due only to heavy rainfall is darker than this. Believe me, you get good at reading the stream when you see it every day. A bit turbid but definitely not to the same degree as the stretch downstream from the project. You can see what is probably the top of a stormwater retention vault straight ahead. 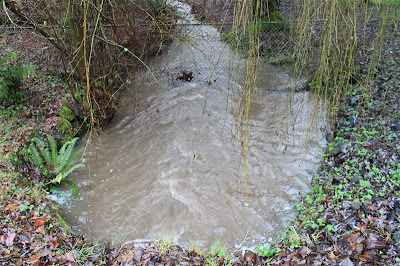 There it is, an unfortunate day in the life of an abused suburban stream. It would sure make a lot of sense to require methods of Low Impact Development (LID) to be used on projects so close to a stream like this project is. Until then, we will continue to contact the city, file reports with the state Department of Ecology, and record events here for all to see. Hopefully someday enough people will become aware of the impact that development is having on their watersheds that there will be a wholesale shift to Low Impact Development. If you would like to learn more about LID, here is a website with lots of links - epa.gov/owow/NPS/lid/.